The lack of high-resolution measurements of 3D ecosystem structure across broad spatial extents impedes major advancements in animal ecology and biodiversity science. We aim to fill this gap by using Light Detection and Ranging (LiDAR) technology to characterize the vertical and horizontal complexity of vegetation and landscapes at high resolution across regional to continental scales. The newly LiDAR-derived 3D ecosystem structures will be applied in species distribution models for breeding birds in forests and marshlands, for insect pollinators in agricultural landscapes, and songbirds at stopover sites during migration. This will allow novel insights into the hierarchical structure of animal-habitat associations, into why animal populations decline, and how they respond to habitat fragmentation and ongoing land use change. The processing of these massive amounts of LiDAR point cloud data will be achieved by developing a generic interactive eScience environment with multi-scale object-based image analysis (OBIA) and interpretation of LiDAR point clouds, including data storage, scalable computing, tools for machine learning and visualisation (feature selection, annotation/segmentation, object classification, and evaluation), and a PostGIS spatial database. The classified objects will include trees, forests, vegetation strata, edges, bushes, hedges, reedbeds etc. with their related metrics, attributes and summary statistics (e.g. vegetation openness, height, density, vertical biomass distribution etc.). The newly developed eScience tools and data will be available to other disciplines and applications in ecology and the Earth sciences, thereby achieving high impact. The project will foster new multi-disciplinary collaborations between ecologists and eScientists and contribute to training a new generation of geo-ecologists. Humans have a tremendous impact on the natural environment. For instance, human-modified landscapes are now dominating our planet and the conversion, degradation and loss of habitat leads to species extinctions and severely affects the distribution of species and ecosystems and the services they provide to humanity Hoekstra et al. 2005, Cardinale et al. 2012, Ceballos et al. 2015, Newbold et al. 2015 . Hence, national and international programmes —such as those related to the Group on Earth Observations Biodiversity Observation Network (GEO BON), the United Nations (UN) Convention on Biological Diversity (CBD), or the Intergovernmental Science-Policy Platform on Biodiversity and Ecosystem Services (IPBES)— demand to quantify ecosystem structure and changes in land use and their effects and impacts on biodiversity to better assess progress towards achieving policy targets, such as the Aichi Biodiversity Targets for 2020 set by the CBD ( Pereira et al. 2013, Kissling et al. 2015, Skidmore et al. 2015 ). A major bottleneck for predictive biodiversity modelling is the current lack of high-resolution (i.e. fine-scale) measurements of habitat structures and 3D characteristics of vegetation across regions and continents ( Davies and Asner 2014, Dantas de Paula et al. 2016, Lausch et al. 2016 ). Animals depend on the vertical and horizontal distribution of plants at different spatial scales ( Fig. 1 ), ranging from regional habitat distributions to 3D vegetation structure within local habitats ( Cody 1985, Wiens 1989, Buler et al. 2007, Kissling et al. 2008, Fuller 2012 ). However, current studies usually do not account for this hierarchical nature of animal-habitat associations ( Kristan III 2006 ) because they either use only coarse habitat information (e.g. CORINE land cover types) over large spatial extents or very local information with a fine grain but a small spatial extent. For instance, the CORINE Land Cover database (http://land.copernicus.eu/pan-european/corine-land-cover), a widely used data source, provides consistent geographical information on land cover across Europe, but only distinguishes 44 coarse land cover classes (e.g. only three forest and five wetland types). Small and scattered habitats such as reedbed and linear elements (e.g. hedges) in agricultural landscapes are generally not well represented, and the 3D structural and compositional characteristics of land cover types are not captured at all. This is insufficient for modelling species distributions of animals because their abundances as well as nesting and foraging requirements depend on the fine-scale structure of the landscape (e.g. density, cover and openness of vegetation, edges) ( Cody 1985 ) and on the specific 3D characteristics of the habitats (e.g. vertical and horizontal distribution of biomass) ( MacArthur and MacArthur 1961, Goetz et al. 2010, Lesak et al. 2011, Zellweger et al. 2013 ) ( Fig. 1 ). Hence, high-resolution measurements of 2D and 3D ecosystem structures at fine grain sizes are needed across broad spatial extents (regional to continental) to make major advancements in animal ecology and biodiversity science ( Wulder et al. 2004, Kissling et al. 2008, Vierling et al. 2008, Zhang et al. 2013, Dantas de Paula et al. 2016, Zellweger et al. 2016 ). The vertical and horizontal distribution of plants influences habitat structure and 3D characteristics of vegetation for animals. Illustrated are examples for (a) forests, (b) agricultural and open landscapes, and (c) reedbeds and marshlands. The height, openness and density of vegetation as well as specific habitat features (e.g. tree species, hedges etc.) are key aspects of animal habitat and space use. An exciting opportunity to improve predictive biodiversity modelling is the increasing availability of high-resolution remote sensing (RS) data on ecosystem structures derived from Light Detection and Ranging (LiDAR). LiDAR data enable us to fill the existing data gap by providing fine-scale habitat information across large spatial extents ( Lim et al. 2003, Wulder et al. 2012, Davies and Asner 2014 ). To date, LiDAR-derived 3D ecosystem structures have mainly been applied in local-scale ecological studies at small spatial extents ( Davies and Asner 2014 ). Quantified across regions and continents, the vertical and horizontal complexity of forests (e.g. tree heights, densities, canopy cover and gaps etc.) and the extent and structure of open habitats (e.g. hedges in agricultural landscapes, shrub density and coverage, height and density of reedbeds etc.) can be used for predictive biodiversity modelling. For instance, LiDAR-derived habitat data can be used together with other abiotic variables (e.g. climate, topography, soil and land cover types) ( Kissling et al. 2012, Eskildsen et al. 2013, Aguirre-Gutiérrez et al. 2016 ) in species distribution models (SDMs) ( Elith and Leathwick 2009 ) to predict the abundance and distribution of animals with unprecedented detail and accuracy. This is particular relevant for animal species that depend on complex vegetation structures (e.g. 3D structure of forests) as well as those that rely on linear habitats in agricultural landscapes (e.g. hedges) or on small and scattered habitat types (e.g. marshlands) that are underrepresented in current land cover maps. The aim of this project is to use LiDAR technology to quantify fine-scale 3D ecosystem structures across broad spatial extents. Across Europe, we will focus on (1) ground-nesting breeding birds in forests (e.g. Wren, Wood Warbler, Common Nightingale etc.) for which the 3D forest structure (e.g. forest height, stem density, canopy openness, density of understory etc.) is of key relevance ( Fig. 1 a), and (2) breeding birds in reedbeds and marshlands (e.g. Great Bittern, Purple Heron, Great Reed Warbler, Savi’s Warbler and Bearded Reedling) which are a prime target of conservation and for which high-resolution data on 3D habitat features of reedbeds (e.g. reed height, reed and shrub density, ground dryness etc.) have been lacking to quantify the effects of reedbed management (e.g. desiccation, mowing and reed harvesting) on population declines ( Fig. 1 c). We have access to the largest amount of bird data available across Europe (www.ebcc.info), representing presence-absence information as well as (relative) abundances of breeding birds derived from standardized observation methods. Covering most parts of Europe, the data represent bird census and monitoring data (at fixed locations), national distribution atlases (with 5×5, 10×10 or 50×50 km grid cell size resolution), and site level data (i.e. the number and breeding locations of bird species in specific areas such as nature reserves and Natura2000 sites). We will use these high-quality bird census data together with the newly quantified LiDAR-derived 3D ecosystem structures to model the distribution and abundance of these bird species with unprecedented reality. This will be achieved by developing an interactive eScience environment for object-based image analysis (OBIA) and interpretation of LiDAR point clouds (see below). We will expose the developed eScience infrastructure to two other ongoing research projects, thus increasing the impact, generating user feed-back, and identifying bottlenecks for wider applicability. Postdoc J. Aguirre-Gutiérrez focuses on the impact of land-use change on the distribution and loss of NW-European pollinators. This includes insects such as bees, butterflies, and hoverflies. Predictive modelling is currently restricted to coarse-scale 2D habitat characterization ( Aguirre-Gutiérrez et al. 2015, Aguirre-Gutiérrez et al. 2016 ) and new 3D-vegetation characterization (e.g. amount of hedges, habitat edges, flower strips etc.) has high potential to improve pollinator models as well as prediction of pollination services to European fruits and vegetables ( Steffan-Dewenter et al. 2002, Tscharntke et al. 2012, Jha and Kremen 2013 ). Postdoc A. M. Dokter focuses on the locations of stop-over sites of European migratory song birds (e.g. warblers, thrushes, starlings etc.) as identified from weather radar data ( Dokter et al. 2011 ). A major challenge is to assess the habitat preferences of these migratory birds at stopover sites because multi-scale habitat data (at patch and landscape scale) are usually lacking ( Buler et al. 2007 ). This requires to quantify the density of trees/thickets/shrubs, forest understory structure, vertical structure of open habitats, marshland habitats etc. to assess en route requirements for these migrating land birds. The proposed project will enable scientific breakthroughs in predicting animal populations and species distributions at much finer resolution and higher accuracy than ever has been previously possible. This will strongly push the frontiers of ecology, biogeography and conservation by providing new data and novel insights into the distribution of biodiversity and ecosystems. The availability of LiDAR-derived 3D ecosystem structures across broad spatial extents will have a major impact, maybe comparable to the influence of the WorldClim dataset ( Hijmans et al. 2005 ) on biological and geo-ecological research (>8500 Google Scholar citations in 10+ years). Our developed methodology will be broadly applicable to other animal species and regions, and of major relevance to other fields dealing with massive amounts of LiDAR point cloud data. We are therefore convinced that this project will contribute to transform and rapidly advance current basic and applied research. We are witnessing changes in remote sensing (RS) from grid cell-based approaches to object-based approaches ( Blaschke and Strobl 2001, Heumann 2011, Aguirre-Gutiérrez et al. 2012 ). Because grid-cells merge information of various objects, the object-based approach provides more accurate information and enhances quantitative analysis of traditional pixel-based approaches ( Blaschke 2010, Blaschke and Strobl 2001 ). With the increasing density of point clouds, ever smaller objects can accurately be identified using the characteristic features of the point data that make up the object. Consequently, LiDAR point clouds and high-resolution RS imagery now allow to accurately characterize geo-vegetation objects ( Aguirre-Gutiérrez et al. 2012 ), a key for animal biodiversity science ( Davies and Asner 2014 ). However, handling of these massive amounts of data creates immense challenges related to data storage, management, analysis, processing, and visualization ( van Oosterom et al. 2015 ). The methodological and technological aim of the proposed project is to develop a workbench that supports the workflow for handling, storage, and interactive object-based image analysis (OBIA) of massive amounts of LiDAR point cloud data ( Fig. 2 ). This includes preprocessing of data (data exploration, projecting, tiling, mosaicking), storage of LiDAR files, interactive machine learning and visualization of point data (e.g. feature selection, annotation/segmentation, classification and evaluation), scalable computing, and a PostGIS spatial database ( Fig. 2 ). Together with other data (e.g. 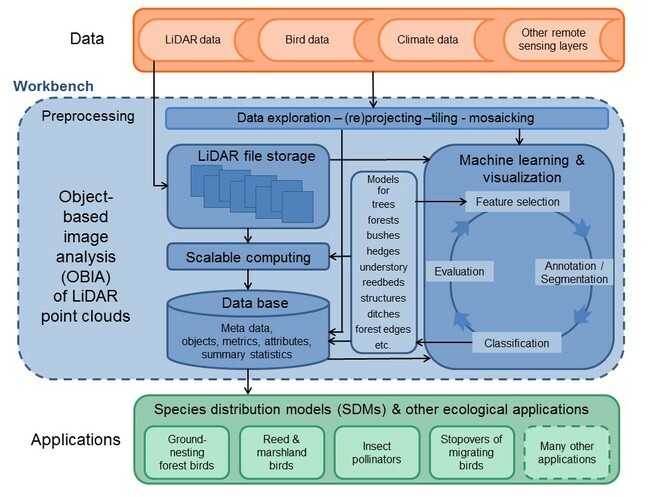 bird data, climate data, other remote sensing layers etc. ), the LiDAR data can then be used for ecological applications, including species distribution modelling of birds and insect pollinators ( Fig. 2 ). The handling and analysis of the LiDAR data to obtain 3D-vegetation and landscape structures at high resolution over an unprecedented spatial extent (regions, continents) requires a multi-disciplinary collaboration of ecologists and eScientists. Generic workflow for object-based image analysis (OBIA) of LiDAR point clouds and proposed ecological applications. A workbench (blue) will be developed to handle the data storage, data exploration, and interactive OBIA of the massive LiDAR point clouds. Combined with datasets of bird distributions, climate, and other remote sensing layers (orange), the LiDAR data will be applied to several ecological case studies, e.g. by using species distribution modelling of birds and insect pollinators (green). We already have many TeraBytes of LiDAR-data (NL, BE, AUT), we are in contact with some other countries (GB, DE), and many European countries have LiDAR data that are available for scientific research (e.g. ES, FIN, DK, SI). We will take care of the differences between data sets in terms of point cloud density and information type (e.g. full wave form, intensity, only first return, additional parallel sensors). Uniform global LiDAR data will become accessible when the GEDI sensor is installed on the International Space Station in 2018 (https://www.nasa.gov/content/goddard/new-nasa-probe-will-study-earth-s-forests-in-3-d/#.VzWjAr4T5fA). Besides LiDAR, we have access to bird distribution and abundance data, climate data, and other remote sensing layers such as Sentinel imagery (https://scihub.copernicus.eu), Landsat imagery (http://landsat.gsfc.nasa.gov), and SPOT vegetation products such as NDVI (http://www.vgt.vito.be/index.html). These will be needed for species distribution modelling. For ground truthing of LiDAR data and derived objects, we will use specific test areas in flat as well as mountainous regions (e.g. cultural landscapes in the Netherlands vs. steep slopes in the Alps) to assess the accuracy of the identification of trees, understory density, shrubs, hedges, marshland habitats etc. in different environments. We will then develop and test the workflow for supervised OBIA to capture the full variation of vegetation across Europe. Scalable storage. We will use existing file-based LAStools for storing LiDAR data. In addition, we will develop a PostgreSQL/GIS database for storing the metadata of the LiDAR and other RS data, and for storing classified objects with their attributes and summary statistics. It should be easy for a user to add new schemas and new objects to the data base. Objects may have different spatial scales (e.g. single trees in a forest, the forest as a whole, hedges or other linear structures, reedbeds etc.). Attributes of e.g. a tree may be tree metrics such as height, crown diameter, biomass, species identity etc.. The data base with objects will be made available to scientists (ecologists, environmental scientists, meteorologists) which we expect will increase the impact of our work enormously (see deliverables below). Tools for machine learning. Traditional tools for geospatial analyses are not yet ready for point clouds. eCognition (http://www.ecognition.com/) is a suite of commercial software for interactive OBIA (including point clouds), but capabilities are still very limited and classification algorithms are (partly) hidden and thus inappropriate for scientific innovation. The challenge in the proposed project is to make use of existing open source software such as the Point Cloud Library ( Aldoma et al. 2012 , http://pointclouds.org/), CloudCompare (http://www.danielgm.net/cc/), and Orfeo (https://www.orfeo-toolbox.org/) and to include machine learning; to closely monitor and make use of new developments; and to complement this by developing new software. From our previous research we have good experience with the WEKA software ( Jakubowski et al. 2013, Frank et al. 2010 ) which covers various machine learning algorithms and data preprocessing tools. We therefore know that several existing machine learning algorithms can provide good results for pattern recognition as long as annotation, segmentation (see Box 1 for an example) and data features are optimally taken care of. The development of algorithms to calculate new features as well as feature selection have emerged as key steps. We will therefore mainly invest in tools for interactive feature selection and annotation/segmentation relevant for object classification ( Anders et al. 2011 ). Visualization. In the iterative process of feature selection, annotation/segmentation, and object classification and evaluation, the visualization is of utmost importance, especially when working on the improvement of methodologies. To be able to visually judge the quality of methodologies and to understand mismatches, we will adapt existing software such as Point Cloud Library ( Aldoma et al. 2012 , http://pointclouds.org/) and Potree (http://potree.org/wp/) for the visualization of merged objects and point clouds. Computation. Once the models and methods for classification of objects (e.g. trees, bushes, hedges, reedbeds etc. ; Fig. 2 ) have been developed, we aim to apply them to large areas (regions to continents). This will require to develop scalable computing solutions. The eScience engineers will develop the proposed workbench (we envisage a combination of LAStools, Point Cloud Library, CloudCompare, Orfeo, QGIS, Potree, as well as newly developed tools) in close collaboration with the PhD student who will characterize the 3D ecosystem structures for breeding birds (see above), while the postdocs working on pollinators ( Aguirre-Gutiérrez et al. 2015, Aguirre-Gutiérrez et al. 2016 ) and bird migration ( Dokter et al. 2011, Shamoun-Baranes et al. 2014 ) will provide feed-back. The combination of this eScience infrastructure and expertise on LiDAR, OBIA, ecology and modelling will further strengthen our position at the cutting edge of eEcology (technology enhanced Ecology). LiDAR data can be used to delineate individual trees in forests ( Jakubowski et al. 2013, Hu et al. 2014, Duncanson et al. 2014 ). In a preparatory study (BSc project), we tested an efficient methodology to segment single trees in a dense forest from LiDAR point clouds. LiDAR returns were filtered from the point cloud, smoothed and rasterized to a 1m resolution Canopy Height Model (CHM). Locations of tree tops were determined using a local maximum filter and the minimum distance between trees. The CHM was then flipped with tree tops becoming sinks. An existing algorithm ( Duncanson et al. 2014 ) was used (originally developed to calculate flow direction and delineation of hydrological catchments) to select cells that contribute to a particular sink. This allowed to assign cells to the tree top and thus to segment the tree crowns within the canopy. The resulting tree crown objects were stored in a data base. 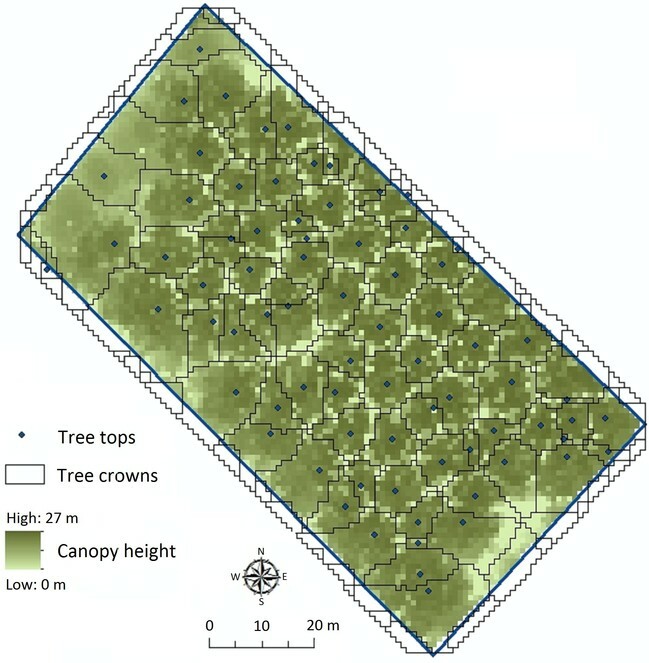 Our example shows how tree crowns and tree tops can be calculated from LiDAR data ( Fig. 3 ). Additional tree metrics could be calculated, including tree height, tree biomass and crown diameter. This example illustrates how existing methodologies can be improved ( Jakubowski et al. 2013 ) by adapting an algorithm and taking into account the information of the LiDAR point cloud. A further improvement of the algorithm would be needed for the proposed applications ( Fig. 2 ) to reliably identify different types of trees in a mixed forest, canopy openness etc.. Example of identifying trees in a forest from LiDAR data. Illustrated is a small plot of poplar trees in Flevoland, The Netherlands, for which tree crowns and tree tops have been calculated. The use of LiDAR point clouds is dramatically increasing. A generic challenge across many disciplines and applications is the storage and handling of massive amounts of data, the visualization, and the automated identification of objects (models) prior to the actual interpretation or analysis ( van Oosterom et al. 2015 ). This approach (LiDAR/RS data - object modelling - application) is generic, whether it is about the identification of 3D-vegetation structures ( Heumann 2011, Vierling et al. 2008, Jakubowski et al. 2013, Hu et al. 2014 ) or 3D subsurface structures from geophysical data ( Fadel et al. 2015 ); operational flood mapping ( Brown et al. 2016 ); detection of snow avalanches ( Eckerstorfer et al. 2016 ) or landslides ( Stumpf and Kerle 2011, Li et al. 2015 ); identification of illegal forest clearings or land use change ( Collins and Mitchard 2015 ); city planning ( Pang et al. 2014 ), or identifying buildings and their distinct sub-elements such as roofs and facades ( Le et al. 2016, Vetrivel et al. 2015 ). Our new eScience tools will be available to other disciplines and applications and thus achieve broad impact. We will re-use the database knowledge and visualization tools developed in the past NLeSC PointCloud project ( van Oosterom et al. 2015 ) and the gateway that we developed in EUBrazilCloudConnect ( Elia et al. 2016 ). We also build upon existing open source software for RS, OBIA, and visualization. Our research group is active in both the Geo- and Bio-world. We will promote the eScience approach and disseminate the results through publications in both disciplines. Since 2008 we organize one or two international PhD summer schools every year. We envisage to organize a future summer school on 'OBIA of LiDAR point clouds for ecological applications'. LiDAR and OBIA also play an important role in education at the University of Amsterdam where we contribute to the eScience training of the next generation of geo-ecologists. Macroecology and RS are important and promising research directions of our permanent staff members. A follow-up with new (international) projects is thus guaranteed and as the developed infrastructure is crucial it will be maintained after the project. We have agreed with SurfSara (https://www.surf.nl/en/about-surf/subsidiaries/surfsara/) to use the National e-Infrastructure of the Netherlands (e-Infra). The project will require a substantial storage for all raw data and LiDAR files (max 0.5 PB). Since we have a very good experience with the central hosting of data at SurfSara, the PostgreSQL/GIS database of the proposed research will be hosted by e-Infra. In the beginning, we will collect LiDAR data and store these in a file-based archive. During the development phase, we will then use subsets of the LiDAR data from different countries. The vast majority of the LiDAR data will only be used when upscaling the analysis to Europe for relevant ecological applications ( Fig. 2 ). In addition to data storage, we will need Virtual Machines in the SURFCloud for various components of the workbench. For the large-scale classification of objects, we will use the e-Infra Research Capacity Compute Service (www.surf.nl/rccs). This combines Cloud, Cluster, Grid and Hadoop computing. The best scalable computing for the classification of high resolution objects at large spatial extents has to be identified during the project. The suggested workplan and time table is illustrated in Fig. 4 . eScience engineers will work closely together (over the first ~3 years) with the PhD student who will do the 3D ecosystem characterization for breeding birds. The role of the eScience engineers is to develop and implement the four elements mentioned above and to integrate these with existing software in an interactive workbench. The PhD will contribute to the workbench developments and generate feed-back from a user perspective. The PhD will then use the workbench to analyze the data of test areas in flat and mountainous regions and to produce the objects that are needed for the species distribution modelling in the 4th year. The associated researchers can make use of the workbench and generate feed-back. Time table for the eEcoLiDAR project (assuming a start in March 2017). The work plan covers tasks for the NLeSC engineers, the proposed PhD student, and two associated Postdoc projects. We envisage that we need various expertise of eScience engineers. We will take advantage of the existing knowledge in the Netherlands eScience Center (NLeSC) regarding handling, storing and visualizing of LiDAR data. NLeSC knowledge and skills on machine learning and scientific visualization are essential as eScience engineers will take the lead in developing the workbench. This will be in close collaboration with the PhD student and the supervisors who will be involved in the design and will generate feed-back during the various phases in the development process. At the end of the 3rd year when OBIA is applied to large areas the PhD student will probably need some help with scalable computing. We also envisage several brainstorms with the involved eScience engineers, the PhD student, supervisors and associated researchers to design the workbench as a whole and to discuss the requirements. After three years with contributing to the methodological and technological challenges, the involvement of eScience engineers will be limited to their input to scientific publications and outreach. The PhD will then finish his/her research by using the classified objects for species distribution models. We foresee that the eScience engineers will be mainly working at NLeSC with frequent meetings (at least one per week as our institute is just across the street) with the PhD student and one of the supervisors. A SWOT (Strengths, Weaknesses, Opportunities, and Threats) analysis (provided as report), with evaluation of existing open source software that can be used for the workbench, both from the developer and user point of view. Data base for LiDAR meta data, object models, and classified objects with their metrics, attributes and summary statistics. The data base will also include climate data, other remote sensing layers and bird data that are needed for developing species distribution models. The LiDAR objects information in the data base will be made available to the scientific community. PhD-thesis with 4-5 scientific publications focusing on 1) methodology of Object-Based Point Cloud Analysis (incl. case applications); 2) workbench design for Object-Based Point Cloud Analysis; 3) data publication(s) providing the classified objects from different LiDAR datasets, 4) the added value of 3D vegetation information for distribution modelling of ground nesting forest birds; and 5) identification of reedbeds from LiDAR data and its application to the distribution and abundance of birds in reedbeds and marshlands. Presentations at conferences and workshops and general outreach. We thank two anonymous referees and the assessment committee of the Netherlands eScience Center for the positive evaluation of this grant proposal. Spatial patterns of woody plant and bird diversity: functional relationships or environmental effects?